Dr. Montessori was one of the first educators to recognize that the first few years of a child’s life are critical to the development of personality and intellect. Children at this age are enthusiastically seeking out knowledge, and learn quickly and naturally. Our classrooms are led by experienced Montessori certified teachers in an enriched environment. The furniture and materials are toddler sized, enhancing the freedom to learn. 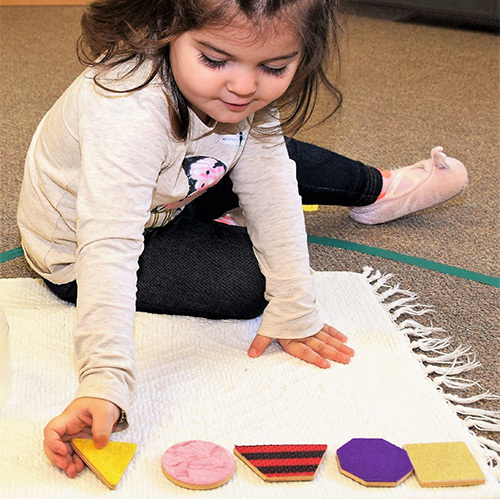 Our curriculum is designed to nurture cognitive development, speech and language, strengthen gross motor and fine motor skills, introduce grace and courtesy lessons, and promote independence.Explosion of language is the hallmark of the toddler years. Pre-reading activities along with daily conversation and reading help children gain rich vocabulary. Hands-on exploration is characteristic to promote physical independence and confidence. We offer a safe, warm and loving atmosphere with the emotional needs of the child given a priority. The teachers will help educate and support parents as this is often their first experience in an educational environment. When ready, the teacher will work with parents to promote the student’s toilet training needs. Our classroom has a 4 to 1 student/teacher ratio with a maximum of 12 students.